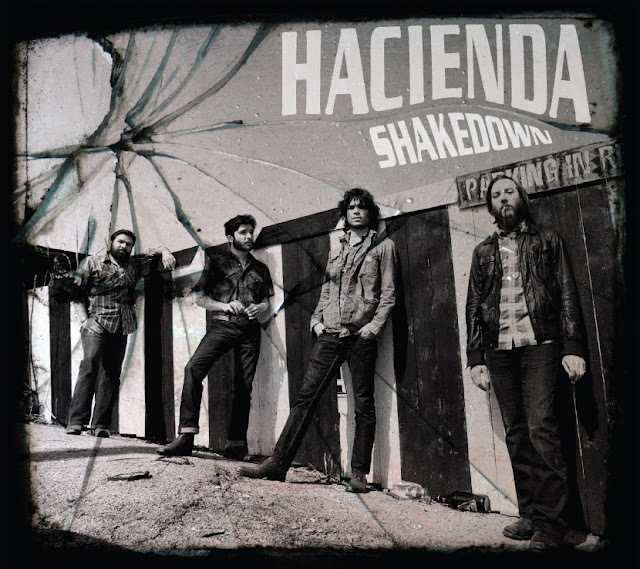 Hacienda to most - maybe it's a UK thing - would be considered a new band, but they are actually gearing up for Shakedown, their third LP release and just dropped new track, "Don't Turn Out The Light". It's never a bad thing to have a seasoned pro like Dan Auerbach on your side is it? who wouldn't like that? Pair The Black Keys' El Camino success with Hacienda's Shakedown release and we may be on to something. Lets not take anything away from the band though, who've been touring hard and opening up for some very respected acts, including Dr Dog, Arctic Monkeys and obviously, The Black Keys. "Don't Turn Out The Light" isn't quite what you'd expect after briefly explaining the bands background. It's packed full of positivity and upbeat riffage; a far cry from the bluesy moans and groans of a Black Keys track. It's also got a psych tinge to it that sold me in an instant. If The Black Keys finding prominence in an indie pop saturated market is to have any benefits then the emergence of more bands like Hacienda must certainly be one.